The Statler-Hilton epitomizes Mid-Century architecture on a large scale. Few other structures in Dallas have had as much impact on the growing city or — in a state of abandonment — garnered as much discussion for a revitalized downtown. Vacant of humans (but not furnishings) for 11 years, the iconic building is now poised to undergo restoration and return as a viable project 55+ years after opening. The city of Dallas — growing rapidly in the post-war years — had a strong desire to attract a new convention hotel. A group of businessmen formed the Cosmopolitan Hotel corporation to offer $1.5 million in financial incentives to any taker, and in 1950 Statler Hotels responded with plans for an 800-room hotel on a block of land close to City Hall. The site contained the city’s third home for the YMCA (a 5-story structure constructed in 1907), which had been converted to the 75-room Savoy Hotel when YMCA moved a few blocks north. Statler Hotels acquired the property along with 5 other parcels on the block; had the hotel’s offer to purchase the old Carnegie Library been approved, an additional wing of several hundred hotel rooms would have been designed for the site. Due to Korean War steel-rations, fundraising delays and Dallas Central Library controversy, the project did not begin construction until October 1953. Conrad Hilton purchased Statler Hotels in 1954 and the Dallas project took on the new Statler-Hilton name. A magnificent star-studded opening in 1956 was one of the biggest celebrations the city had hosted for years. The front desk in 2011. Clocks from world time zones hung in the panels above. The structure was designed to be modern in every way, breaking from traditional hotel design of the past. The Y-shaped building allowed for a luxurious off-street driveway, shorter corridors and dramatic skyline views. Architect William B. Tabler introduced a cantilevered structural system — the first full application of its kind — to eliminate many interior columns and supports. The building rose quickly using a thin-skinned curtain wall consisting of 1 3/8″ panels made of glass and locally-produced dark green porcelain coated metal. A system of exterior vertical piping turned the building’s heating and air-conditioning ducts into pieces of architectural decoration. 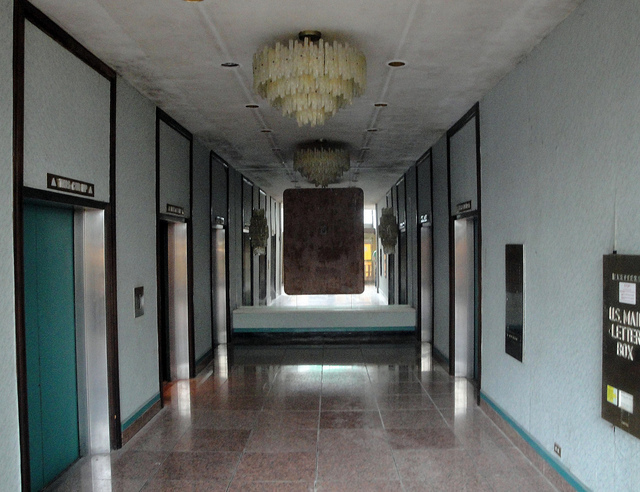 The elevator foyer in 2011 bears little resemblance to the original design. While its 19 floors towered over the adjoining Dallas Central Library (built consecutively with the hotel) the interior public spaces retained the intimacy and thoughtful space planning of the age. Instead of locating ballrooms at the top of the hotel (common in pre-war architecture) an expansive mezzanine level was easily accessible from the street. The Empire Room, ballroom and lobby all emptied into a lush garden designed on the west side of the hotel. This garden contained “A Wishing Star,” a rotating sculpture by artist José de Rivera. The 12 foot high, 15 foot diameter stainless steel and gold-plated sculpture became the Statler-Hilton, but disappeared years later. Large windows allowed natural light to enter public spaces; the mezzanine — complete with floating staircases featuring frequent landings — curved back from the front wall to give the lobby a greater sense of height. Despite filling nearly an entire block, the design of the lower levels was broken up with interesting angles and windows along the street; numerous doors led to retail shops and an interior concourse. 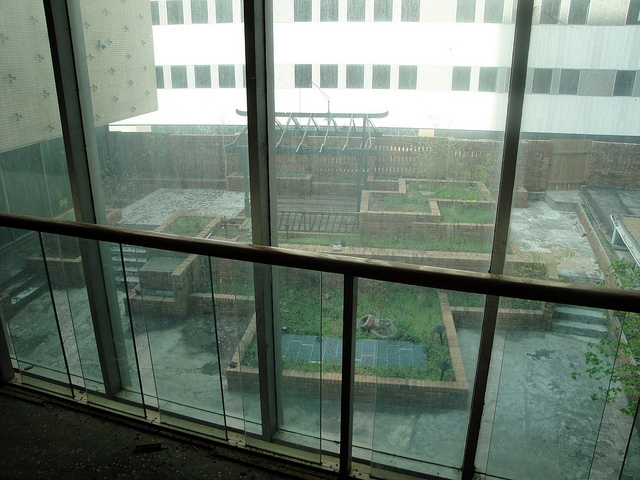 The second floor garden (as seen from the ballroom level) once contained the hotel’s signature sculpture. 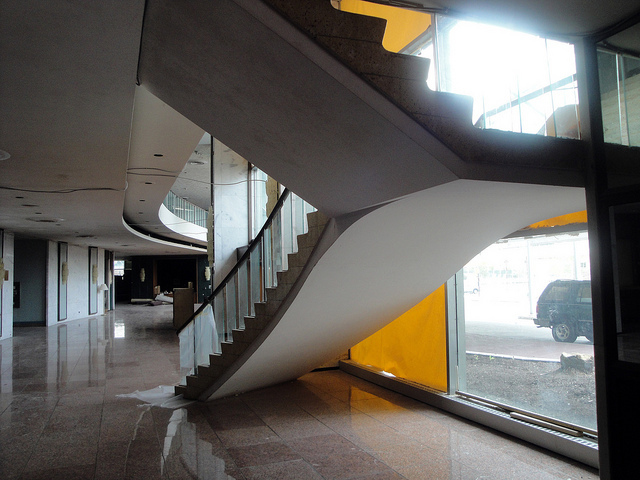 The lobby features elegantly floating staircases; the ballroom level curves back from the front wall. The ballroom level featured the largest ballroom in the Southwest (capable of holding 2,200 people), 4 side ballrooms, 14 dining rooms and 26 meeting rooms; a special hoist could even raise vehicles into the ballroom from Jackson Street! Within the hotel, a labyrinth of pneumatic tubes sent invoices and receipts in small sealed capsules. A series of smaller meeting rooms overlook Main Street Garden (a much improved view). The Statler-Hilton featured many guest-related innovations, such as music in the elevators (first in the hotel industry), custom 21″ Westinghouse televisions in every room and rooftop helicopter service to Love Field. 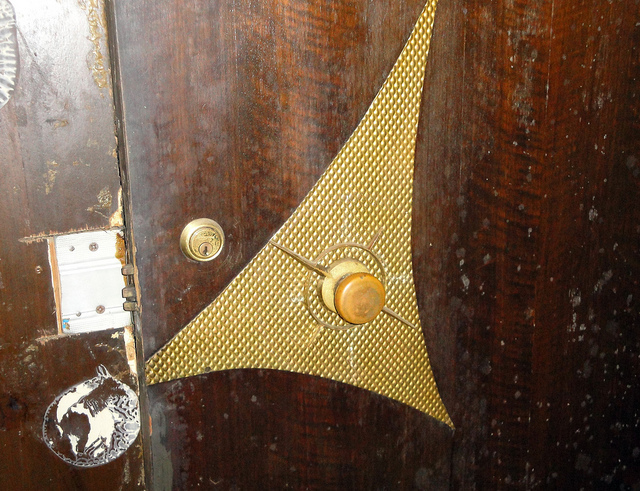 Custom doors allowed cleaning staff to press a button and determine if a room was occupied. The Servidor — a hollow compartment in the room door — also created a way for guests to leave laundry without maids needing to enter the room. The 1,001 room hotel required a daily staff of nearly 1,000 (including 80 cooks in a half-acre kitchen and 9 people to run the massive air conditioning system). 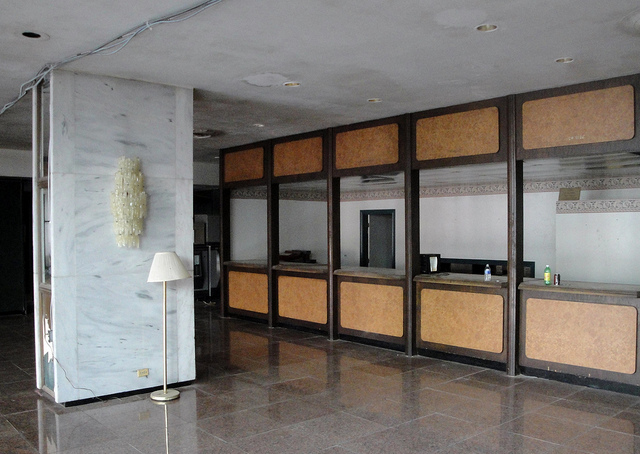 The hotel featured restaurants, a night club, retail shops and airline ticket offices. 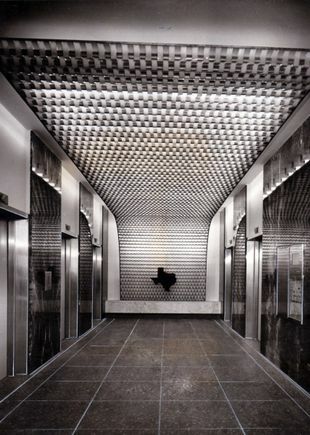 As one of the largest hotels built in the United States in more than 25 years, the Statler-Hilton’s innovative features made it a significant contributor to the Modern movement in Texas, winning acclaim for its innovative engineering. 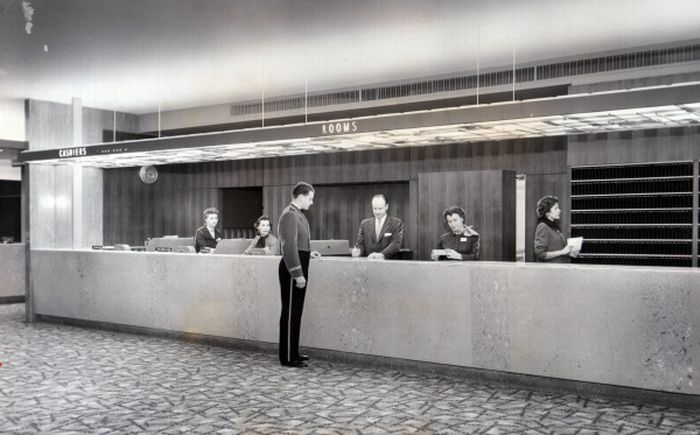 The hotel played an important role establishing Dallas as a business center for the Southwest and helped attract convention business to Dallas for many subsequent years. Over its 40 years of business the hotel was regularly updated and renovated for the latest trends in style and design. The clean, Mid-Century aesthetic gave way to traditional decor, gaslamp nostalgia and 1970s/80s “updates”. Each change in decor modified the original layout of the hotel, resulting in a covering of jumbled styles that remain today. 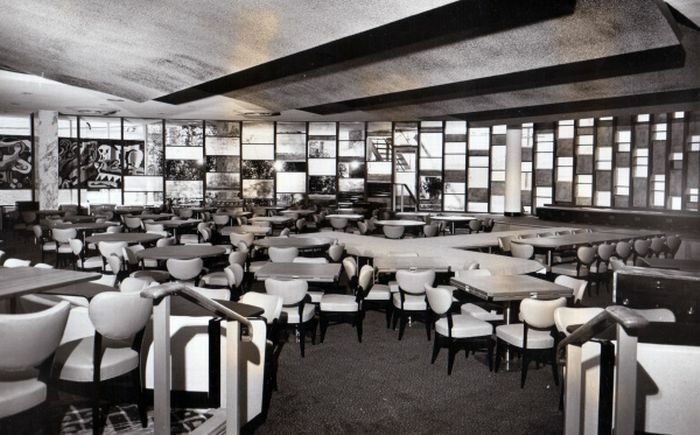 The Empire Room — once a large open lounge — was subdivided into smaller dining lounges; a large canopy was added over the driveway; and Gatsby’s Bicycle Bar transformed the ground floor at the corner of St Paul and Commerce. Many of the guest rooms were enlarged for modern needs, reducing the room count to 710. The glass wall of the Empire Room remains behind layers of additions. 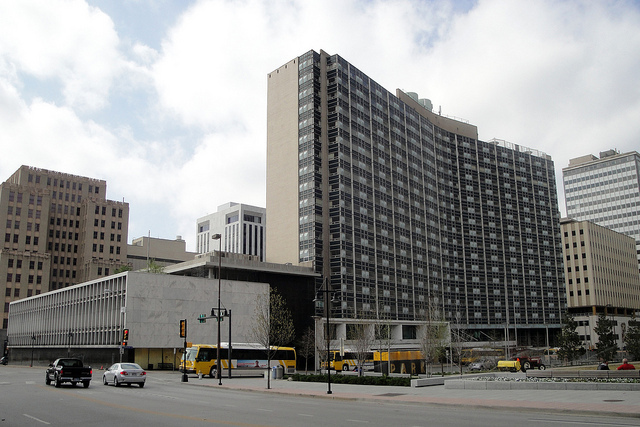 Hilton Hotels sold the building in 1988, and it became the “Park Inn Plaza.” Its last renovation came in 1991 when it was sold to Hamsher International Ltd. of Hong Kong and renamed the “Dallas Grand Hotel”; the hotel closed permanently in 2001. As soon as the hotel closed, city leaders tried to find a use for the site. They proposed demolishing the entire block (and closing Commerce Street) for a 4.7 acre downtown park. This understandably irked preservationists, who reminded officials that AIA’s Guide to Dallas Architecture called this “the best block of 1950s architecture in the city.” Razing the structure would not only be prohibitively expensive, but would upset a growing following of Mid-Century design fans. The plans were changed, orienting the park to the ornate Dallas Municipal Building and saving the Statler-Hilton. 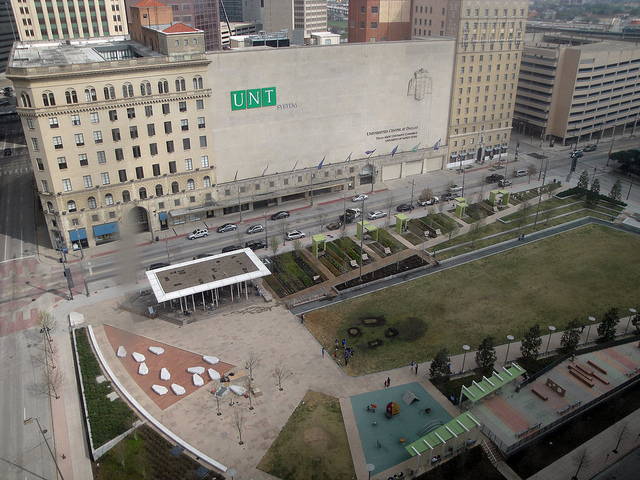 Main Street Garden opened in 2009, replacing parking garages and small commercial structures with a vibrant, urban park. Preservation Dallas included the structure in both its 2007 and 2008 Most Endangered lists and campaigned for preservation of the landmark hotel. 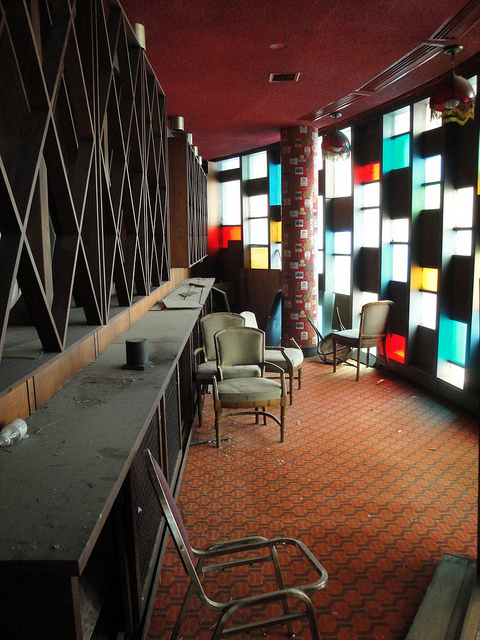 In 2008 the National Trust for Historic Preservation included the Statler-Hilton on its 2008 list of “America’s Most Endangered Places,” citing its importance in American Mid-Century design. Various proposals for redevelopment — into condos, student housing or boutique hotel rooms — came and went; most developers claimed the lower ceilings, asbestos remediation and economics were too large a challenge. But in March 2011 the building — along with the library next door — was sold to Ricchi Developments Group. The group plans to preserve and restore the building’s historic facade, clean up the inside, replace mechanical systems and prepare it for future development. Little has changed in the Zig Zag Room, featuring the W-shaped coffee bar. The building’s renovation will not be easy (or cheap). Despite excitement for redevelopment the challenging logistics of cleaning such a massive structure could take several years. 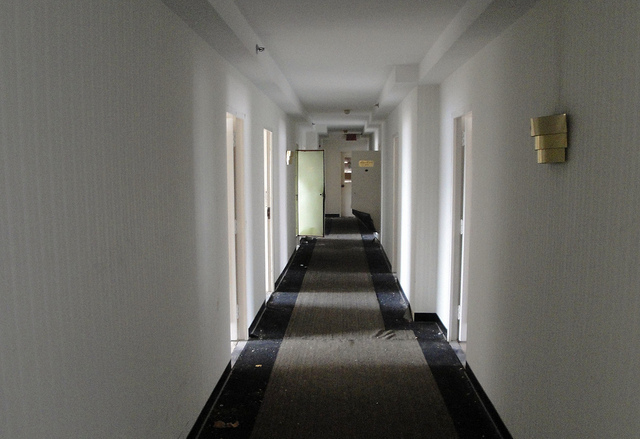 The hotel was left completely furnished — everything from coffee pots to mattresses (and even a grand piano) were locked away when the hotel closed in 2001. While only a fraction of the rooms were damaged by water or intruders, it will be quite the task to remove 700+ rooms worth of mattress sets, bedside tables and televisions with only a few operating elevators. Beyond the guest rooms, stacks of conference room furniture, outdated electronics, mechanical equipment, mildewing carpet, and unoriginal fixtures will need to find a new home. 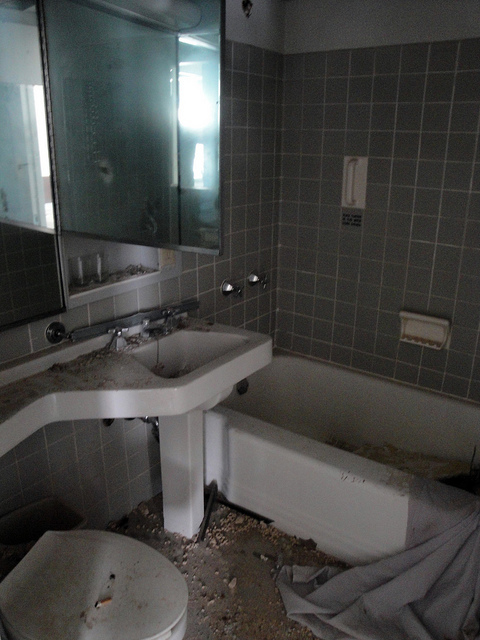 Add to this situation the presence of asbestos, and the process takes even longer (pipes in guest bathrooms were cut by previous owners and asbestos insulation was scattered across the floors). If the water were to be reconnected now, the Statler would become downtown’s largest fountain. A typical guest bathroom in 2011. Despite all of these challenges the new owners are optimistic that the building will return to its former glory. Having met with historical preservation officials, the team is slowly peeling back layers of unflattering renovations. 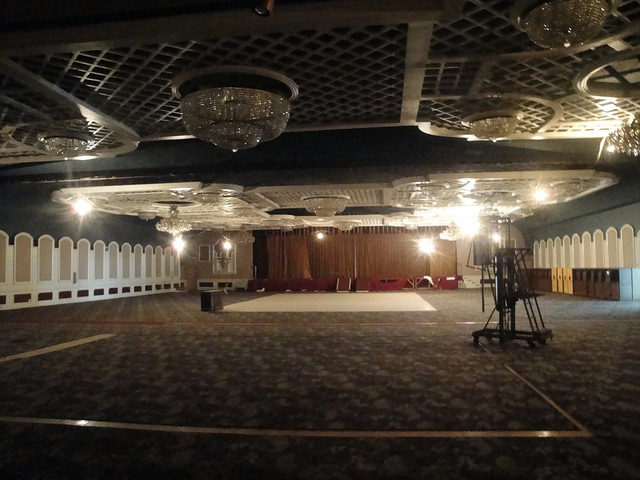 Original terrazzo floors have been revealed beneath carpet; the motorized stage in the Empire Room (able to lower for ice skating performances and raise for concerts) is still there; the front desk may be hiding its original marble panels. Scattered throughout the building are wonderful Mid-Century surprises (and some areas that make you wonder “what were they thinking?”). The distinctive facade is already being prepped for a good cleaning. Stylish Mid-Century design features still remain throughout the structure. 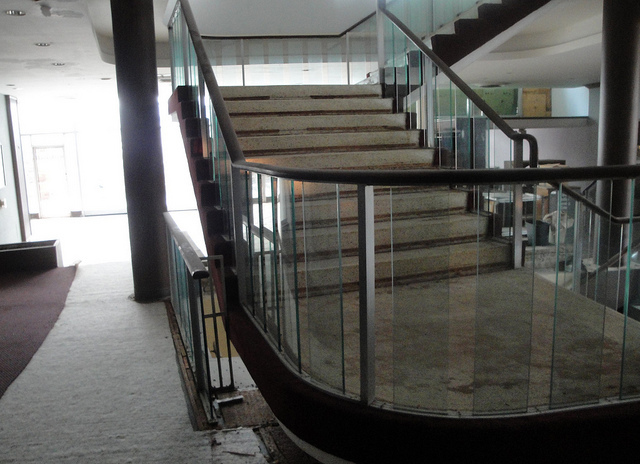 The carpet on the west staircase has been removed to reveal the original terrazzo. The Statler-Hilton’s reinforced concrete frame is strong enough to support a variety of new uses. While specific uses will be determined by market conditions, there have been proposals for hotel space, residential apartments, assisted living and student housing. Ceiling height — a concern for previous buyers — are similar to those in buildings of the era. The doors to the guest rooms are significantly smaller than today’s standards, giving the illusion that the ceilings are too low for modern needs. With doorways enlarged the height could visually increase (the large windows also provide ample natural light). While it is true that redevelopment may lower the ceilings with the addition of mechanical systems, creative planning could produce a very intimate but spacious layout. Today’s eco-conscious resident may prefer a smaller, energy-efficient living space instead of a high-ceiling loft. 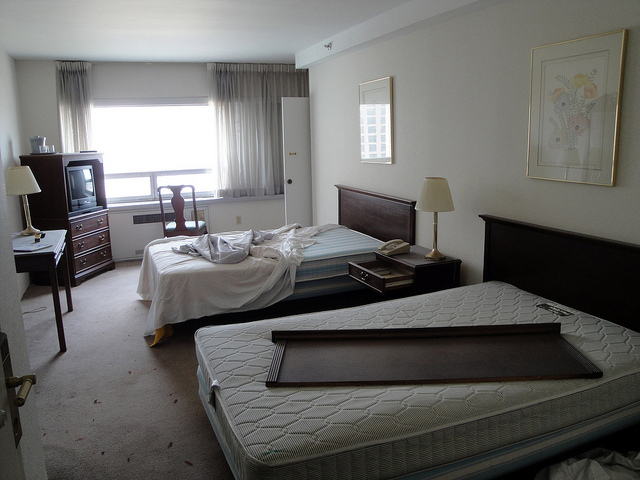 Typical guest room in the hotel in 2011. Corridor of rooms on a typical floor. The shear size of the structure (we didn’t even see the lower levels on our tour) makes the renovated structure a prime candidate for mixed-use development. A combination of residential, entertainment and retail uses could go into the space with room left over. The popularity of Main Street Garden (which opened in 2009) may entice restaurants to fill the ground floor spaces; wonderful skyline and park views may convince residents to make this their new home. The Statler-Hilton is in the center of action for the east end of downtown. The building’s rebirth will bring activity and enhanced identity to the Harwood Historic District; and a revitalized Statler — swinging with Mid-Century vibe — will give a huge boost to the ongoing revitalization of downtown Dallas. To view more images, visit this album. Special thanks to Richhi Developments Group for the pre-restoration tour; visit their project offices in the base of this building. The library lounge is full of surplus hotel supplies waiting for a new life. 12 Responses to "Statler Hilton, Part I"
I have a letter opener from the statler hilton from 1956, contact me if your interested in it. I am working on the Statler project and I would be interested to see what you have. I’m hoping that artifacts like this will be incorporated into a display once the new building is opened back up to the public! I remember the hotel when it was still (barely) open in the 80s. It reminds me a lot of the Riviera Hotel in Las Vegas. I can’t wait to see her brought back to life, but I will have to admit I’m not looking forward to a developer’s “sterilization” of such a swanky 50s building. I would like to talk to someone who went to the openin gala in jan 1956. 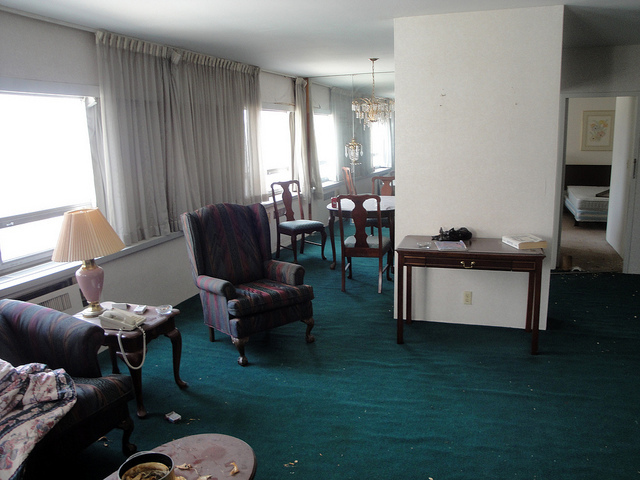 I would love to chat with anyone regarding the history of the Statler. If you have artifacts, stories, or attended events/stayed at the hotel, we’re a part of the restoration campaign of the building. We’d love to talk to you! I was a child most of the time looking back at the Statler. I have memories of staying there when we were in Dallas to visit my grandparents. I remember the elevators and their MUZAK :), and I remember my father getting the car parked for us. I remember the bolted down lamps and the beautiful view of Dallas. I remember the English Hoover Commercial upright vacuum cleaners and the early central vacuuming system. For a five year old little girl the Statler was an excursion into high fantasy. I will never forget it. My fondest memories of the Statler-Hilton took place over a 3-day weekend back around the early 80’s. I went there to attend what was at the time Dallas’ first major comic book and sci-fi convention – The Dallas Fantasy Fair. I got off the bus @ Main and Ervay and made my way to Commerce and Harwood. When I got my first glimpse of the hotel, I felt like I was about to enter a grand palace; it was like something out of Las Vegas. As I entered, I couldn’t help but look in awe as to how spacious the main entryway was. Even though there were a lot of people milling about, there was still room to spare! The main ballroom, where most of the action was that day, was huge! Not only did it have enough room for the merchants’ area, but parts of it were sectioned off for seminars and discussion panels. I also remember going up to the next two floors where several rooms were reserved for anime movies and role-playing games. Walking through the hallways, you got a sense of how opulent this place was in its heyday; kinda made you feel like a celebrity. I fell in love with that place that very weekend and been in love with it ever since. 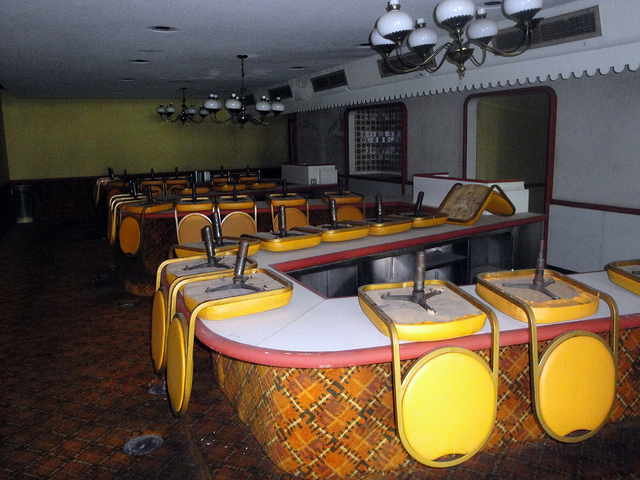 It was a great place to go to back in the day and I look forward to being there again when it reopens in 2016. Here it is 2016 and I am also holding that same letter opener from 1956 with the coin at the top. It’s in good shape. 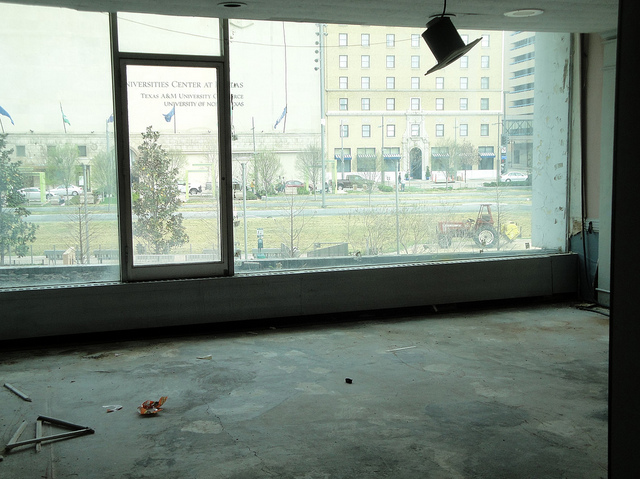 We might have a few more things from the old Statler Hilton but not sure what yet. I think I saw some tiny spoons. 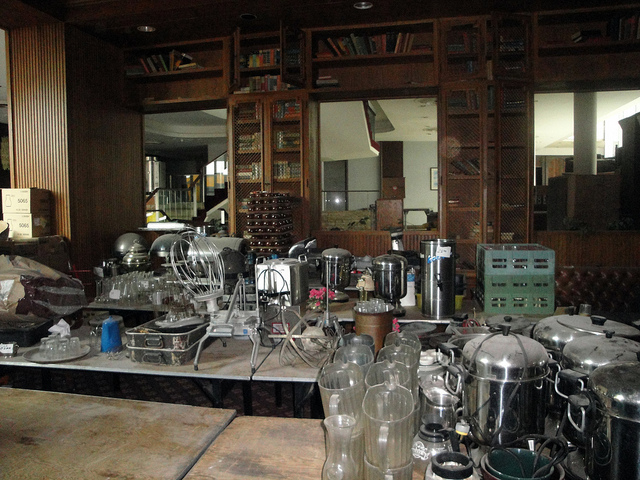 My father worked at the hotel back then in Food & Beverage and my family is going through items to clear out the house. If anyone is interested post here.